The Civilized line of spirits is distilled at a new 5,600-square-foot facility on Old Mission Peninsula just outside Traverse City, MI. Sitting along the shores of the west arm of Grand Traverse Bay grants the property the optimum humidity, micro-climate and water to instill a unique essence of the North in every bottle of spirit. 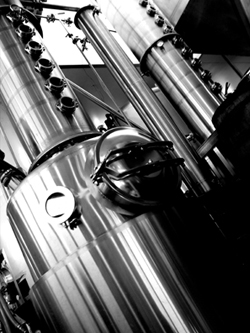 Because this system does yield such clean spirits, it’s possible to ferment and distill a rum or whisky before a vodka. This harkens back to our desire to be economical and efficient in everything we do. In line with our dedication to conservation, the facility employs a Clean-in-Place (CIP) system that filters and reclaims cleaning chemicals so they can be used multiple times. When their useful life runs out, the cleaners are diluted so there is no environmental impact whatsoever. In addition, the facility is lit by compact fluorescent light bulbs (CFLs) to reduce energy consumption and is heavily insulated to contain heat.